I love the Sepia Technique from the October TJNL, maybe it's the vintage look it adds to your projects....Plus it makes for a QUICK card! 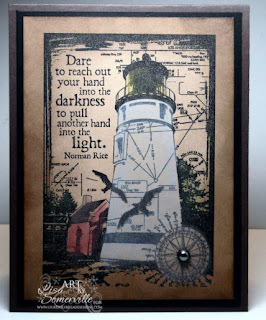 Here I stamped the Lighthouse and sentiment from Our Daily Bread Designs, Keep My Lamp Burning in Black Archival on Caramel card stock, then finished with the Sepia Technique. Don't forget Paper Temptress is running a Treasure Hunt, full of surprises this week. You'll be able to pick up a clue from my blog on Friday! Beautifully done sepia! I love how the lighthouse pops out from your gorgeous background. FAB, beautiful image, beautifully done! Beautiful card, love that image but the saying/sentiment of it really draws me in! What a stunning card, Lisa!! Love the sensational sepia background for this wonderful lighthouse! !